Here is the “Social Media – Big Picture” Tweetinar, Part 2! As I said, I love performing seminars all over the country. I do 1/2 day seminars, full day seminars and even 2 day seminars on Social Media Marketing, Email Marketing, Internet Marketing, Creative Thinking, and Innovation. I also love social media, especially Twitter. So here are the two combined!On February 1st I launched my first Tweetinar, “Social Media – The BIG Picture” based on Part One of my book. This “Tweetinar” delivered social media insights three times a day, five days a week at 10:00 AM, 12:00 PM, and 2:00 PM, Monday through Friday, and ran all the way through March 9th. There were more than 120 separate social media insights! On March 10th, I launched my biggest Tweetinar yet! “The Five Steps To Social Media Success”, based on Part Three of my book and contains more than 320 separate tweets! 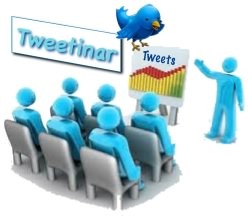 If you missed any of my first Tweetinar I will share those social media insights with you in each of two, bloginars. The second 60+ social media insights are below. Be sure to RSS this blog or check back soon for the final 60 tweets to complete your Social Media – The BIG Picture bloginar. Also remember to follow my tweets for more social media insights and the biggest Tweetinar yet! • Because it’s cheap, it’s effective, and there’s millions of people in there. • That average 42 yo gamer means, there is as many older than 42 as there is younger. • Maybe in-game advertising isn’t for you. What about creating a game for your site? • This author experiences an 18% conversation rate. That’s nearly 1 out of five buys his book! • A web site game is some of the best “fish food” you can have! Remember, it’s about good content! • Marriott has more than 600,000 visitor and Southwest Airlines has more than 1,000,000 visitors to their blog each year. • Bill Marriott blogs because his customers tell him what theyre doing right & what they’re doing wrong so they can stop! • CEO Bill Marriott is in his 70’s, never turned on a computer in his life, but blogs every week! • CEO Bill Marriott dictates his thoughts into a digital recorder and his admin transcribes it to his blog. There’s no excuse for you! • Google Juice is the number of pages Google has indexed for your content. Blogs… Add… Google Juice to your site. • Link Love or External reputable links is where people outside of your site link back to your site. A HUGE factor in your Page Rank. • Free blogging sites want your Google Juice and Link Love to drive traffic to them to sell advertising. • Install WordPress on your web site. It’s free and takes only 20 minutes. • GoDaddy or Bluehost will actually install WordPress for you! • If you want to go to the top of the Google search page, Blog! • Google, Yahoo, MSN, all of the search engines give your blog preferential indexing! • Web page never get preferential indexing, blog do becuse by definition, they’re FRESH! • For a given set of keywords, should Google return a web page that hasn’t been updated since 2007 or your blog from yesterday? • Instead of taking 12 to 14 days for your page to get indexed, blogs get indexed in 30 minutes! • Blogs get you Link Love, Google Juice and preferential indexing in 30 minutes! • A good test of your web dude’s integrity is if they say there was any cost or it took more than 20 minutes to install WordPress. • Cyber-surveillance, Google Alerts, TweetDeck, Seesmic Desktop, and Social Mention. • Social Mention (,com) will give you any mentions of search text in 80 different social networks! • You have a responsibility to monitor your brand, company, product or service in cyber-space. • People ARE talking about you! It’s not just your schizophrenia talking, your meds have that under control. • Get involved in the conversation. Listen. Then participate. • It’s like going to a business function, step up listen for a while, then contribute. • At that point you become a trusted part of that conversation. • Listening allows you to encourage any good conversation and immediately diffuse any negative. • If someone at a bussiness event said something bad about you or your company, would you walk away, or explain why it isn’t true? • Whether you have time or not, just like email, you have to go through them People are communicating with you. • I don’t care if you aren’t “into” Facebook. It’s not about you. It’s about your customers! • If you customers are on Facebook (525 million people are), then you need to be there, where your customers are. • I LOVE email marketing! Where else can you get up to a 18% conversation rate from a marketing tool that’s free! • With email, I can keep 175 conversation going simultaneously! • I love email marketing so much, I put together a 41/2 hour DVD on it! • You need to understand: segmenting, day-parting, bounces, subject line, the from account, the 1.54 Second & the 5 Second Rule! • You also need to know opens, forwards, pass-alongs, & SPAM. If you do, you can get up 35% conversion rate! • 17% with email marketing sure beats 1/2% with direct mail. Why do direct mail ever again?! • Mobile will be the fastest growing technology segment over the next two years. BE PREPARED! • The rest of the world is YEARS ahead of the US with mobile marketing because of our affluence. • Most of South America, Africa, Eastern Block, & countries in Europe can’t afford desktops, laptops, and broadband. • They do everything we do on their smartphones, up to 80% of all financial transactions from gas to food! • QR Barcodes (Quick Response) are amazing and free. Google QR Barcodes and start creating your own. • I have QR Barcodes on my business cards, my brochures, product sheets, everything. One click and your customer is there! • Download the free app, point your smart phone at my image and instantly, your phone opens my web site, calls my office, sends me an email. • No matter what form of communication you are currently comfortable with, start using VIDEO! • People like video! You convey trust faster in video than any other format! • Create videos, use your imagination, post everything to YouTube. Post your best ones to Vimeo! • If someone sends you a link to connect with them on a network you are currently on… CONNECT! If thet’re there, so are your customers! • You can use “Open Social” to create your profile on a new network with only one click! • You need to blog, create profiles, upload photos & videos, create podcasts, set alerts, comment, get linked, explore social media! • You can’t win if you’re not in the game! This is the end of my Bolginar or Tweetinar on “Social Media – The BIG Picture”. Be sure to RSS or check back for my biggest Tweetinar ever, “The Five Steps To Social Media Success”!